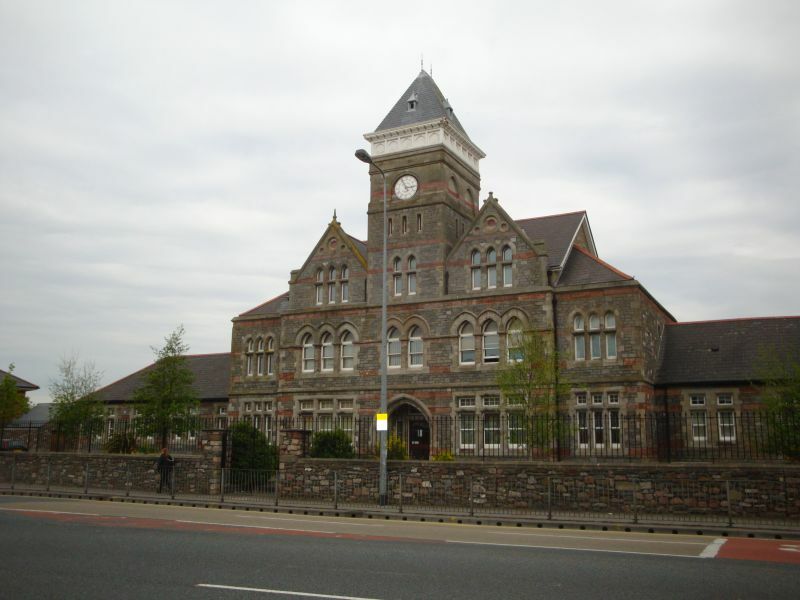 Location: A prominent building in the centre of the Community at the junction of Cowbridge Road East and Wellington Street. The original building was constructed as Canton Union Workhouse in 1839 following the Poor Law Amendment Act of 1834. It was intended to serve the poor of a union of forty-four parishes. It was greatly enlarged in 1881 and the surviving building is a part of this development. 1879-81 by James, Seward and Thomas. Remaining buildings demolished for redevelopment 2001, when the surviving building was fully refurbished. Former central entrance block of the south-east wing of the Canton Union Workhouse. Two and three storeys by five bays; Welsh slate roofs, walls faced with blocks of stone laid in regular and irregular courses; ashlar bands and dressings. Each outermost bay of two storeys only with hipped slate roof; on first floor a 3-light transom window to each, with pointed heads to lights; a flat headed window each on ground floor. E ach intermediate bay with gabled attic storey and flanking stone stacks; each gable with 3-light transom and mullion attic window with pointed heads to lights; a triple window each on both first and ground floors, first floor windows with pointed heads, ground floor windows square-headed. Centre bay of two storeys with crowning tower; window of two pointed headed lights on first floor and pointed headed doorway on ground floor. Tower of three storeys, lowest storey with two-light pointed headed window, middle-storey with three narrow vertical lights and upper storey with clock face; arcading beneath steep pyramid roof with gablets. Two small windows to the hipped end of either wing. Not available for inspection at time of resurvey. Included for its architectural and historic interest as the surviving part of a Union Workhouse standing unusually close to a major city centre. A prominent building at the junction with Wellington Street. Set back from the south end of the road behind a boundary wall and hedges. Part of the group of fine Victorian houses at the south end of Cathedral Road.